The eternal question of National Gaming Day: "What shall we play next?" Saturday was National Gaming Day 2010. In observation of the day, the Fletcher Free Library here in Burlington hosted an afternoon of board games. I didn’t get to stay for the whole afternoon, having agreed to run demos as a Man in Black down at the Gathering of the Gamers in Middlebury, which just happened to fall on the same date as National Gaming Day this year. Along with a pair of plastic bins full of board games, Brennan brought fresh baked bread still warm from the oven, which was a great snack paired with Cabot cheddar and/or raspberry preserves. So we had something to nibble on while we played Pirate’s Cove, one of a pair of a games I’d set up in anticipation of potential players arriving. As it happened, it was mostly the gang from Tuesday nights, plus one young newcomer, Max. Meanwhile, a second group formed to play Dominion with a healthy helping of Duration cards from Seaside. Pirate’s Cove went okay. It’d been long enough since I last played that I had to keep reminding myself how the game went. Max turned out to fit the model of a young player, to be honest, which has led me to wonder if I’m courteous or excessively picky about other people’s behavior while playing a game. After Pirate’s Cove, we kept up the piratical theme with a round of Liar’s Dice. By then, I had to head south to Middlebury. From what I’ve heard, the rest of the afternoon was given over to Age of Empires III, Citadels and more Dominion. Saturday was gloriously sunny, abnormal for mid-November in Vermont. I’m thinking that had something to do with the turnout for National Gaming Day — it was good in terms of spending time with friends, but as a way to get more people playing board games, it was pretty weak. While we’ve gotten good at spreading the word within the existing social circle of Burlington gamers, I think we still need to work on reaching people who aren’t necessarily connected via social networking or other means. That and the Fletcher Free’s involvement came relatively late in the ramp-up to National Gaming Day. Hopefully, next year they’ll get on board sooner and take a more active role in promoting it to interested patrons. 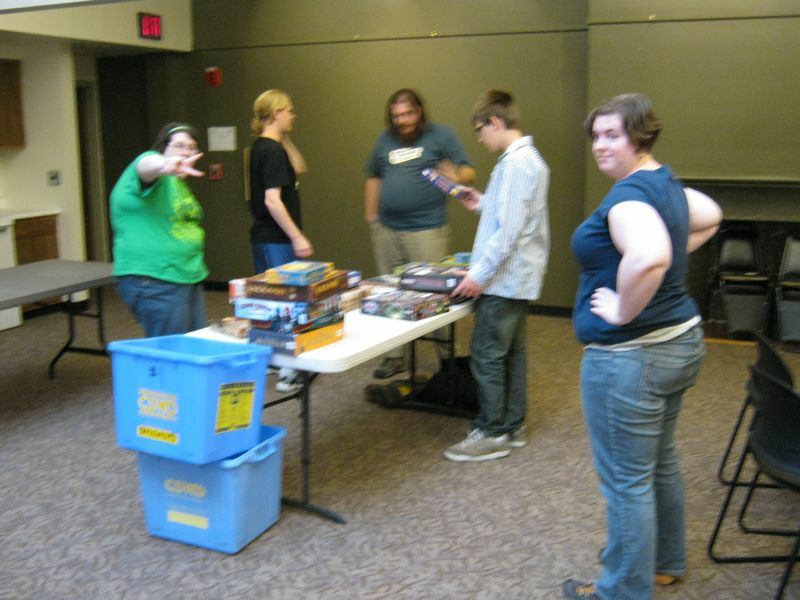 Meanwhile, over in the Northeast Kingdom, Border Board Games hosted the gaming at the Goodrich Memorial Library. They had a pretty excellent turnout, with lots of new faces. Kudos to Bethany and Richard for being such great game hosts! Tomorrow, November 13th, is National Gaming Day 2010. Over 1800 libraries are participating this year, celebrating the twin goals of playing more games and visiting your local library with both board and video gaming, including tournaments and prizes donated by game publishers. In Vermont, there are about a dozen libraries participating in National Gaming Day. Of two of them, I can tell you more. Richard and Bethany, they of Border Board Games in Derby Line, will be sharing some of their favorite board games at the Goodrich Library in Newport, Vermont. Their favorites and whatever else they can fit into the Big Frakkin’ Bag — which, frankly, needs to be documented to be believed; it’s just that big. Meanwhile in Burlington, I and some friends will be at the Fletcher Free Library playing games and hopefully meeting some new folks. Until I need to cut out to go demo games as a Man in Black at the Gathering of the Gamers in Middlebury. It’s going to be a busy Saturday for board games! If you’re not sure what’s going on in your area for National Gaming Day, you should check out this Batchgeo map that shows all the currently registered participating libraries — Burlington isn’t on there yet, but they’re definitely on board. Get out and play some games tomorrow! This afternoon I met up with Will, the teen literacy coordinator at the Fletcher Free Library here in Burlington. After missing the chance last year to attach our own Saturday board gaming to the National Gaming Day participation roster, Brennan got on the stick early, which led to my meeting Will today. I think we’re on track for something fun this November 13th. Will’s excited to have people interested in bringing board games to Fletcher Free Library programming — or ramping it back up, since Saturday board gaming went into summertime hibernation — and we staunch hobbyists will be happy to get the slightly higher profile for a day. Video games seems to be the emphasized element at National Gaming Day, judging by photos and comments from the previous years’ participants. I hope that a more board game — and dare I hope role-playing? — centric game day at the Fletcher is in the offing. Not because I have anything against video games; they’re just not my thing. If someone rolled up to the Fletcher with an armful of consoles and monitors on November 13th, they’d fit right in. I can even think of one or two people I with the ability to do so. But I do think this is going to be more of a non-electrified game experience. I’m really looking forward to it. It’s the Saturday after Carnage, which is a shame in some ways, because there are people who will still be too fried to make the trek. The scheduling could work out in other ways, though. There are always people who can’t or don’t go to Carnage. A library game day might be the right thing for them. Today marks the one year anniversary of Held Action‘s first publication, from the day I made my post of introduction and reported on local Free RPG Day activities. Those posts actually date from the brief period of time when I blogged on Dreamwidth. A couple weeks later, I got tired of the limitations of the cloned LiveJournal interface and crossed over to WordPress. That also pushed me to think of a name for the blog, and it wasn’t until I had thought of something I liked better than “Tyler’s Game Blog” that I bought the domain and set up this blog on WordPress.com. What a year it’s been. First I chose a schedule to keep myself to, then I had an enormous spike in things I wanted to say, then I fell back into the more comfortable schedule I’d originally chosen. I’ve run through most of the material I wrote in other times and contexts, so now it’s all fresh, usually sparked by something I’ve read or heard elsewhere. And that’s what I wanted in a gaming blog: a place to publish the thoughts and ideas I had that I didn’t feel like putting in someone else’s discussion forum, but still wanted to make public. According to WordPress.com, here are the top ten most popular posts of the last year, least to most. It’s amazing what the viral bump can do to hit counts, isn’t it? National Library Week 2010 Drumming up enthusiasm for an endeavor that inspired Saturday gaming at the local library. The Art of Board Game Storage When I get a game room of my own, I’ll use this technique. Game Master Mistakes: Not Really Listening I know enough to fess up when I make mistakes. A Screen for Every Game Promoting my favorite GM screen, the customizable sort. Physical Evidence Extolling my enjoyment of Propnomicon‘s Lovecraft-inspired creations. Labyrinth Lord: Downward to Adventure! My actual play report for International Traditional Gaming Week. The Lurker at the Threshold Expands Arkham Horror One of my inconsistent moments of pseudo-journalism. Scouting and Dungeons & Dragons Most mind-boggling is this one posted last week and it’s already number three in terms of hits. The Arkham Horror Expansion Guide One of those wonderful moments of blogging came when I saw someone else recommending this post on Boardgamegeek.com. Ah, gratification. How to Make a Pamphlet Prop I really do intend to get back to making that Ghostbusters proper suitable for download. Honest. This past Saturday was my first time back to the Fletcher Free for board games in some time, due to the travails of real life. While I wanted to get back into the swing of weekend gaming, which has been growing nicely since its inception in November, that Saturday also happened to be the nicest, warmest, most glorious weekend day northern Vermont has seen in quite possibly ever. So it was with a torn heart that I went out of the light and into the high halls of the Fletcher’s original wing. Alex appeared shortly after I and we got in a game of Girl Genius, a flipping, spinning, matching symbols card game based on the webcomic by Phil and Kaja Foglio. This was one of the very first games I bought when I got into the hobby in 2002. It’s seen a lot of wear since then; mostly because it’s a solid two player game, but also because it was the game I brought along when I studied abroad in London. It suffered more from the transportation than use there, but I did get in one session at a monthly game day at the university or college near Elephant and Castle in south London. I can’t remember the name of the institution, unfortunately. Anyway, while we played Girl Genius, Greg arrived, and then shortly thereafter, Sascha. With four, we got in most of a game of Dominion before Dean arrived. We moved on to yet another game, this time RoboRally, which I hadn’t played in over a year, having last broken it out for Geek Week in 2009. RoboRally is one of those games I wonder if anyone ever actually finishes. I’m sure there are dedicated players out there who see a race through to its conclusion, but in the three or four times I’ve played, the end condition tends to be someone needing to leave or everyone agreeing it’s time to play something else. This time, I even made a point of choosing a short, relatively uncomplicated race course. With five players, it seemed reasonable we might actually finish the course by the end of the afternoon. Then Munk showed up, and Sarah after him. They both readily hopped in, as RoboRally is forgiving that way. The struggle to catch up with the rest of the pack compensates for a new entrant’s robot having less damage and programming quirks. With a smaller race course and that many robots on the loose, there was a sufficiently amusing amount of nonsense. For my own part, I showed off time and time again I have real problems telling left from right in time-sensitive situations. Specifically, Twonky spent three or so whole turns spinning in place on an archive and repair spot. This was good in that he got some nifty new options installed, but fell behind in the race itself. The lure of the gorgeous day outside finally got to me around 3:00. We’d taken a break for parking meter refills and when the suggestion came up to switch games to get Orson into the mix, who had arrived not long ago, I decided to take the changeover as an opportunity to go enjoy the sun and unseasonably warm temperature. Unfortunately, the whole group decided to go as well as that point. I feel responsible for that. I really didn’t think everyone would elect to go as well. In retrospect, I can imagine everyone else thinking, “Hey, he’s going outside to enjoy the sun. Why would we stay indoors?” It was an interesting lesson in group dynamics and what it takes for a group to become self-sustaining. Apparently, it takes weather worse than the first 80˚ F day in Burlington, Vermont since early September 2009. So it goes. Less than a month from now is National Library Week 2010, an effort by the American Library Association to celebrate the contributions all libraries and their librarians make. Neil Gaiman is the honorary chair this year, and his benevolent visage graces any number of graphics and posters you might find on the ALA’s website. Tabletop gaming has become a growing part of library programming, particularly with National Gaming Day @ your library in November, which has gone on for the past couple years. A number of libraries in Vermont have on-going game programming, including Ilsley Library in Middlebury and Kellogg-Hubbard in Montpelier. If your own gaming community lacks a meeting place, or wants to reach out of the game shop to venues frequented by the general public, consider having a game day at your own library. Most librarians are eager to increase foot traffic through the door, particularly the younger set. Conveniently enough, Burlington Board Gamers celebrates our local public library, the Fletcher Free, on April 17th by playing board games in their community room. Swing by and say hello. This week’s Actual Play Friday report is brought to you by Brennan, a local Burlington gamer. In addition to spearheading the new program of board games at the Fletcher Free Library, he’s a general partner in crime when it comes to fostering widespread playing of tabletop games, as well as an avid miniature painter. A world hangs in the epidemical balance. Photo by Brennan. Tyler has allowed me to describe the activities of the most recent Game Day at the Fletcher Free Library here in Burlington, Vermont, on February 6th. The day started off with me meeting Mike for the first time. I then had the opportunity to introduce him to that highly colorful and semi-tetrisy (I made a word!) game of Blokus. It’s a great game for two or four players with rules that take a literal minute to teach. Essentially you are taking turns laying down various shapped tiles onto the board. Each piece you lay down has to touch one of your own pieces, but only on a corner. The object is to play all of your pieces before you run out suitable places on the game board. In practice this involves trying to carve out sections of the board for yourself and to try to cunningly infiltrate your opponents turf. It’s a game I highly recommend and that I really should get to the table more often. Afterwards, Orson, Sasha, and Nonny showed up and I showed them how to play Alhambra. As usual, it was a very fun game, though I did not have my usual luck with it. 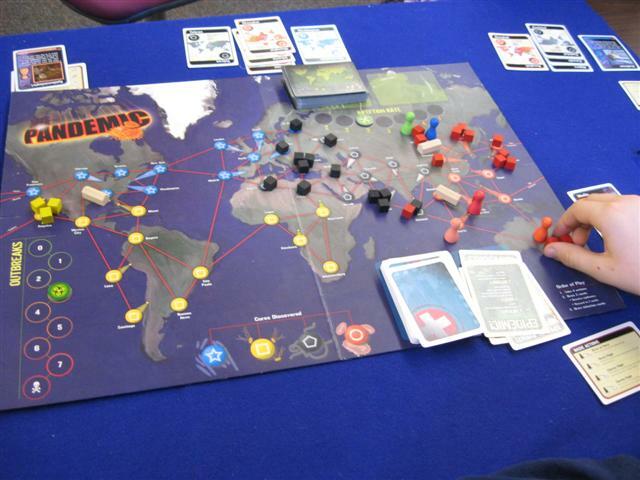 We then broke out Pandemic. We had one of the most atrocious starts I have ever seen with Asia being nearly saturated with the initial outbreaks to the near exclusion of the rest of the board. The early turns were rough with a nearly immediate outbreak. But with perseverance, we chipped away and found our cure for the dreaded Red Cube Plague, and sprinted to find the additional cures. All looked lost as we counted up the remaining turns and discovered we had only five player turns to cure the two remaining diseases. But, after plotting for a half hour we actually came upon an intricate dance of actions that allowed us to win the game on the very last turn! We ended the day with a few rounds of Incan Gold. Another fast and simple (no matter what the Austin Star says) favorite. As I write this, I am looking forward to even more gaming this coming weekend at the Fletcher. But whatever should I bring to play? Brennan, Sasha, Matt and Chad (left to right) scrounge for one more ticket of the right color. This past Saturday was the kick-off to a series of twice monthly game days hosted by the Fletcher Free Library here in Burlington, Vermont. Organized by the dauntless Brennan Martin, these Saturday game days came from the desire to give the opportunity to play games to people who couldn’t necessarily work Quarterstaff Games‘ Tuesday evenings into their schedule, because of geography, other commitments or what have you. So Brennan took the initiative to organize the initial test events, schedule the use of library space and twist the arm of all his game-playing friends. After two successful Saturdays, the Fletcher decided to make board games a regular part of their programming, which meant it could happen more than once a month, by their rules for community members using library space. 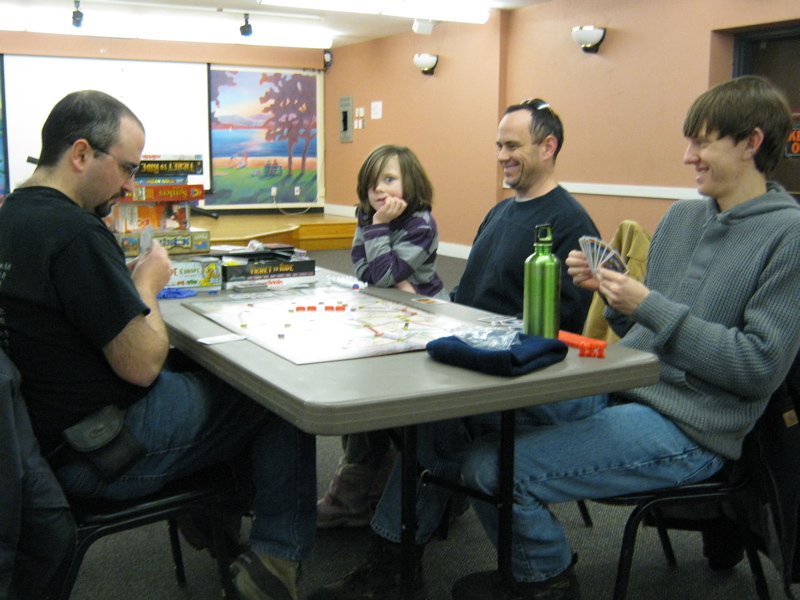 As Brennan announced over on Burlington Board Gamers, the Fletcher Free Library decided to make board game days a regular part of their programming. The fun starts January 23rd, a mere two Saturdays away. From then on, there will be game days twice monthly in the library’s community room — well secluded from the high use areas of the library, so we can celebrate critical successes and failures appropriately. Details still need to worked out about the exact timing of the Saturdays in question. The nice thing about this opportunity is it opens up the opportunity to play board games to people who typically can’t make the Tuesday do at Quarterstaff Games, or wouldn’t normally wander into an out of the way hobbyist shop — Quarterstaff may be centrally located in Burlington, but it’s easy to miss up on the second floor of the building unless you know what you’re looking for. If the last two library game days are a guide by which to judge, this is going to be fun. There’s lots of table space, a solid five hour block in which to play and the opportunity for newcomers to discover tabletop games. Both times we played at the Fletcher, we had new people come in just to see what was going on, then sit down and play.